Three weeks ago the CGAO & OCGA hosted a joint conference to profile and heighten awareness on and around the sectors tremendous value that it brings to this province. The event was extremely well attended by delegates and supported by our sponsors and focused directly on the Ontario Charitable Gaming Sector. The initial feedback both organizations are receiving is extremely positive and with a request to make this an annual fixture in our calendars. Both organizations are reviewing this as a serious option in 2018. The keynote speaker, Mr. Jean Major [CEO AGCO], inspired the audience with his concise history of the sector and value it brings to the numerous communities where a Community/Bingo Centre operates in the province. He acknowledged both the CGAO & OCGA for their combined leadership in delivering a focused and consistent message of the sectors opportunities and challenges and then presenting them in a professional manner within a framework of partnership. The conference first session/presentation was always going to be an important one, one that would set the tone and focus of the conference. After long consideration, both the CGAO & OCGA leadership concluded that nothing would set the tone better than having the ‘Play-Smart’ team of OLG and RG-C speak about all the developments on the new approach in this field, which went over extremely well with all the delegates. Without question, this was a very successful event, well worth all the effort and hard work that was deployed in bringing the conference forward. I would like to thank Ms. Patricia Petrolo, Mr. Richard Schwar and Ms. Sandi Nesbitt for their combined efforts on top of their normal day-to-day duties. On Monday, the 20th November, the CGAO hosted its General Members Meeting at the Hilton Hotel (Mississauga). As part of the Chair & President [Mr. Tony Rosa] drive to bring in guest speakers, this meeting provided an opportunity for Mr. Tom Mungham (COO – AGCO) to address the members. The presentation/address by Tom was received with high praise from the members. It covered numerous areas and acknowledged the Joint Pilot Project currently being undertaken by CGAO & AGCO on the Registrar’s Standards. Tom also acknowledged the collaboration that had been taken on this year and the high point of that was the Joint Presentation undertaken at the North American Regulations Association Conference in the USA in June 2017. It is the intent of the Chair/President to continue to invite guests throughout 2018 to our General Meetings. The Chair/President [Mr. Tony Rosa] wanted to take this opportunity to publicly thank Tom for coming and addressing the membership. Mr. Tony Rosa (CGAO) & Mr. Bill Wilson (OCGA) together hosted a joint executive meeting prior to the Forward Together Conference starting. As both teams were in the same hotel, it was an excellent opportunity to sit down together and discuss both the challenges and opportunities that are before the sector. The discussion was both constructive and valuable in the exchange of issues. Both teams acknowledged the value in doing this more often. On Friday, 1st December 2017, the Kingston Bingo Group played host to the partners of the Revitalization of Charitable Gaming in celebrating a landmark achievement of the Kingston Community Gaming Centres and their combined 120 Charity/Non-Profit Organizations that both participate and benefit from the Gaming Centre activities. The co-ordinators of the event, OCGA and their Executive Director Ms. Lynn Cassidy, spoke of the tremendous value this partnership brings and the difference it makes within the community, both in terms of the $C16.5m actual dollars and then the community dollars, which generally doubles the value through the efficient and effective manner that local Charities/Non-Profit deploy them in the community. It was greatly encouraging to have in attendance Sophie Kiwala MPP for the riding of Kingston and the Islands, who acknowledged the presence of numerous volunteers and stressed their importance in this program. The municipality was represented by the Deputy Mayor, Jim Neil, who could directly relate to the community value as he himself volunteered years ago to support a local charity group to raise funds in the Community Gaming Centre, which has changed and improved with all the investment since that time but the valuable work and community funds that these venues bring has not. He also thanked the volunteers and staff for all their work and assistance. The OLG was represented by Ms. Diane Gartshore – Director for cGaming who acknowledged the OLG is proud of the revitalization initiative and the role we play delivering back to the community. Diane also took a moment to thank the customers for their engagement in the process. I would also like to acknowledge Mr. Peter Howard – Diamond Game, who has made it a policy of his company to be present at the majority of these events since they started. Peter said ‘I am not here just representing the company, I am here to support this unique initiative’. Finally, to Mr. Jeff Holmes at Kingston Bingo Group and his staff for playing host and co-ordinating on the ground to ensure the event went off well. The Revitalization of Charitable Gaming continues to move forward. The recent screen saver change that was introduced across the province does change the look of the terminals and brings forth a selection of messages to the consumers, most notability ‘Play-Smart’, which is an important awareness piece for our consumers. As both the CGAO & OCGA always anticipated, the GTA Centres would be the engine to drive the overall program performance and through 2017 this has not changed. What has been most encouraging is that we are now looking to add NEW Charities/Non Profit Groups to certain Centres due to the success. This is a critical piece and reverses the trend of the previous 15yrs where we were losing charities from 6,300 to an estimated 2,200 today in all sixty (60) Centres in the province. Our colleagues at the OCGA are working with the City of Toronto to potentially place new Charity/Non-Profit Groups who meet the requirements for inclusion to the program. We are still working to drive the consumer experience forward. We, at the CGAO, also understand that this would require the ‘Social Gaming Experience’ bingo to evolve and adapt to the changing taste and wants of the consumer, both in terms of product platforms and the accompanying entertainment features. We continue to support and promote this approach with our partners to allow this initiative, ‘Revitalization of Charitable Gaming’, and revise the years of decline in the sector. It is encouraging to see that Commercial Operators continue within their Centres beyond the initial conversion cost and this investment and number continues to grow. We estimate that this is now around $C56 million and climbing, which is more investment in the last four (4) years than the previous fourteen (14) years. I want to acknowledge this action taken by the Commercial Operators in making these investments. Our recent quarterly meeting, held at the Responsible Gaming Council (Ontario) offices in downtown Toronto, reported a 12% increase in consumer touch-points over the previous year. This data is produced by the Responsible Gaming Council and they have been doing this since the program started so we are able to see the growth in awareness and touch-points, both to staff and consumers from one quarter to another. Thus, it has become a consistent benchmark of performance. Just a reminder that the new Ontario Minimum Wage kicks in on 1st January 2018 with the immediate increase to $C14.00 per hour and a further increase scheduled for the 1st January 2019. The changes to the Ontario Labour Law is broader than just a minimum wage increase and we have enclosed a direct link below for your reference. I wanted to acknowledge the work undertaken this year by the Delta Gaming Group who are celebrating 50 years of continuing business in Ontario. Throughout the year they have been hosting various events to showcase and reward their customers as a way of thanking them for their support to the various Centres they operate in. This is one example of the acknowledgement they have undertaken. Delta Bingo & Gaming recognized for its 50th Anniversary from the Parliament of Canada. 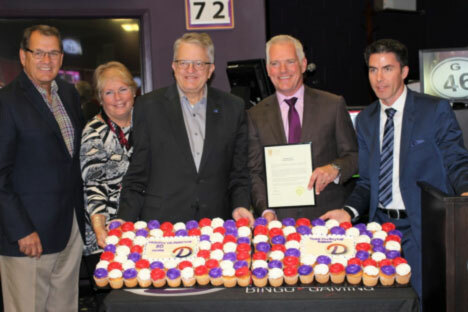 Oakville, Ontario: Earlier this week, John Oliver, MP for Oakville visited Delta Bingo & Gaming and presented Cam Johnstone, CEO at Delta Bingo & Gaming with a certificate of recognition on celebrating 50 years of hard work, fun and philanthropic donations. “Delta’s contributions and commitment to numerous charitable organizations has been integral to our Oakville community” added John Oliver. John also presented Cam with a certificate of recognition from The Rt. Hon. Justin Trudeau, Prime Minister of Canada. This year has been special for Delta Bingo & Gaming as they celebrate their 50th anniversary. “We are proud to look at our past and what we have accomplished as a family and can’t wait to see what’s in store for the next 50 years. Thank you to our staff, customers, charities and all partners.” said Mr. Johnstone. Also, in October 2017 the Mayor of Oakville made a presentation to the company at their Oakville Centre. As the company rounds out the year, they will host all the winners of their ‘Golden Ticket Promotion’ in Toronto on 31st December. This is shaping up to be a very exciting evening where the focus will be on the customers. Congratulations to the Chief Executive Officer – Mr. Cam Johnstone and the Delta Gaming Team on an excellent year. On a recent trip to the United Kingdom, I had the opportunity to meet with the Chief Executive Officer of that organization, Mr. Miles Baron, who managed to fit me into his busy schedule, which was greatly appreciated. Without question this organization, under the leadership of Miles, is the leading organization in this field and whom we, at the CGAO, benchmark ourselves against. The Bingo Association (UK) is dealing with numerous issues - the Responsible Gaming initiative, data management and the overall challenges affecting Retail Bingo Gaming (land base). The fashion and manner in which Miles navigates these issues is quite remarkable. We, in the CGAO, are fortunate to have made a connection and are able to share experiences and gain insight. It is my view that Miles and his team deserve international credit for the work he is undertaking. The Rank Group continues to develop its new brand Luda, which launched this year with the second opening in as many months and has now turned its attention to the northern City of Leeds for its third opening in due course. This is a bold move for the company as it looks to develop and establish ‘Convenience Social Gaming’, navigating on the high street between Betting Shops, Amusement Arcades and Coffee Shops with its unique approach. It is my view that this initiative should be monitored as there will be some important lessons to be learnt as consumers and potential consumer’s habits change and traditional consumer habits evolve. This is combined with the development in their Spanish division with a broader offering of eSports. Please be advised that the office will be closed from Friday, the 22nd December 2017, and will re-open on Wednesday, the 3rd January 2018. Should you require anything through this period please contact Mr. Peter McMahon direct either via telephone or e-mail. Please see the enclosed statement from British Gambling Commission. The Gambling Commission has announced that Sarah Harrison, its Chief Executive, will be leaving the Commission at the end of February 2018 to take up a senior role with the Department for Business, Energy and Industrial Strategy. The search for Sarah’s successor is already underway. A further announcement will be made once a new chief executive has been appointed. Neil McArthur, the Commission’s Chief Counsel and Executive Director, will be appointed by the Commission as Acting Chief Executive with effect from 28 February 2018 until the permanent CEO can take up post.